Ran into Barely Texan...put on a Kunglers dress. Ran into Barely Texan, the male fashionista who had guested on Harper Beresford's blog, and noted DJ, at a social venue. Just for fun I wore an dress and hair that Harper had blogged and took a picture next to him. I then realized I had never blogged this dress myself. This simply pretty and classic dress is the "Ariana" mesh sleeveless sheath from Kunglers. Note that the hemline is slightly below the knee, some don't prefer that hemline, though it's one of my preferred hemlines along side mid-knee and slightly above the knee. This a great desk-to-dinner dress, perfect for standing beside an AFK hipster-ish male fashionista with oversized glasses, and having him make me look good. Which is his job, making whatever lady fashionista he's standing near look good, not the other way around. That would go against the natural order of all things Fashionista. Then there would be chaos, we can't have that. The hair is "Alicia" from Wasabi pills. I am wearing it with my usual Belleza "Betty" skin, and Celoe's "Zoe" pumps. Jewelry is the Bijou Othello set from Sax Shepherd, which is one of my go-to sets and I have the Bijou in all the colors. With this set you have your choice of two earring colors, black or white and it comes with matinee and princess necklaces. I'm wearing the matinee length in the photo. Prepare for Glamour, Like Anna Wintour, inspired by Berry. So what inspires you? Do you get inspired by fashion magazines? Yes, yes I do. I generally read Marie Claire, Glamour and Allure, though I let my Allure subscription lapse and I should renew it. I read Vogue now and again, especially the September issue. So yes, I do get inspired by fashion magazines, websites, pictures, books, catalogs...you name it. The CC decides to channel Vogue editor, Anna Wintour, with a short bob, sheath dress, and dark sunglasses. The dress is the "Caroun", a simple colorblock and lace sleeveless sheath from Doc Eldritch. The skirt has the flattering and proper slightly-above-the-knee hemline that is my favorite hem length. DE has several similar sheath sets, this one does has a fitted mesh option. It's well worth picking up as a nice addition to a capsule wardrobe. My sunglasses are the old Heiress sunglasses from Paper Couture, I think I have some modern ones, but just grabbed these because they're quick to find. The short bobbed hair is "Looking" from Elikatira (which is no longer available, of course),tinted to a proper dark red. The shoes are "Diana" from Fri.day. As is usual for Fri.day shoes, they are worth adding to a capsule wardrobe. The skin is my usual Belleza. The jewelry set is the platinum-diamond tennis set from Earthstones which is a touch overpriced by my standards. But again, it's a tennis set, which isn't common in SL. The clutch is the HUD controlled Muci clutch from Mutresse with 13 color options, plus options for chain and studs. to denounce the evils of Lola's and bling. to shop incessantly and acquire EVERYTHING. Team Fashionista goes shopping at the speed of light. You remember that Grecian myth themed C88 a couple of rounds back, and that u.f.o (ur.favorite.one) Luna dress? Well like everyone else on the grid, Ihave it, in the long and short versions. It is such a pretty ethereal goddessy thing, to me it looks more like a negligee than a dress and I've worn it as such. You have to put up with gaussed and glowed blonde me since I wanted to go all angelic looking. Cup of Goodness and The New Social Club. 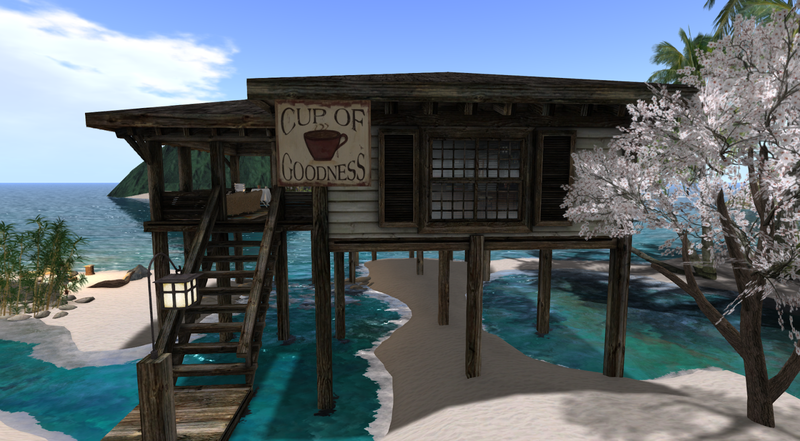 Oldbies in SL will remember the Old Mill Pond social venue, a favorite of those wanting a pleasant place to chat about virtually anything. Others will remember the Cup of Goodness, a similar venue that was a favorite of foodies in SL, which sadly went defunct. It, along side the Duchess were among my favorite venues in SL. Then the CoG was gone and there was a lack of such venues. Sure, the Blarney Stone in Dublin is great and busy, but it's DJ centric and very quiet when there isn't a DJ around. There's a few similar venues in the steamlands, but not everyone likes the steamlands. And of course, the Duchess is sapphic, and not everyone wants sapphic. A place to gather, chat, laugh, dance and see our best friends. While the venue itself is different some of the decorations are from the original version of the CoG, recognized them right off even if Lis hadn't mentioned them. And I got a shot of Lis herself, on the nearby beach boardwalk, wearing Truth "Isle" hair and Maitreya's "Poise" dress. And as is usual for my CoG visits, I am now thinking about muffins. Foodies! They'll get me every time. Luckily I have muffins. Strangely, this new CoG reminds me of the "old" "Ookami Ningen" version of the Duchess, which is a good thing. I still have a soft spot for that version. Anyway, if you want a place to just chat, hang out, make friends, and perhaps exchange recipes. (Foodies loved the CoG), then head on over. Tell 'em CC sent you. Yes, I've been playing Minecraft on the PS4. Main difference between it and the PS3 version is the draw distance, world size, and the PS4's ability to take screenshots and video. That creeper sure did surprise me. Screenshots after the break.